This post is part of a series called Caffeine Fuelled Vector. Adobe Illustrator's 3D effects can be a used to create quick, yet realistic product mock-ups. While not a full ray-tracing 3D application, Illustrator's 3D feature is quite sophisticated, and it has some advantages over its more expensive counterparts. 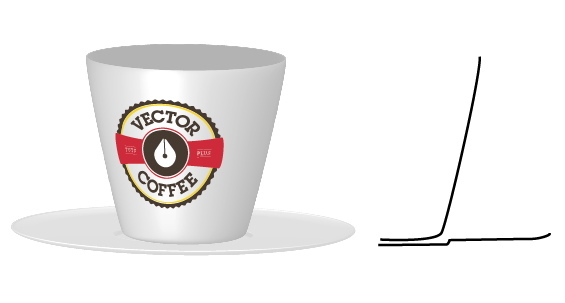 For starters, vector objects and effects can be scaled to any size without loss of quality. It's easy to re-purpose vector art you've already created, plus you don't have to leave the friendly confines of Illustrator. And as you'll see in the following steps, the learning curve is not nearly as steep. Let's get started! The first step is to draw a path that will form the 3D shape. You might want to use a photograph for reference, or a sketch. Or you can just experiment, modifying the path after you apply the 3D effect. The 3D effect, like all Illustrator effects are "live". That means it can be edited as many times as you like, without degrading the quality of the image. I used a photo reference to draw a simple path, as shown below. You don't have to draw the entire cup outline, just the right half of it. Before applying any effects, go to the Effect > Document Raster Effects Settings. Choose at least 150ppi, preferably 300ppi. Change the Stroke color to white. With the path still selected, go to Effect > 3D > Revolve. Enter the following values in the dialog box. Make sure the Revolve originates from the left edge. Your cup should now look like the image below. It's a bit rough, so to edit the settings, click the effect's name in the Appearance panel. If you don't see the surface and lighting options at the bottom of the dialog box, click More Options to reveal them. Increase the Blend Steps to 200. If you have the Preview box checked, you'll see that the surface of the cup is now much smoother. In the lighting section, click the new icon to add a new light. Adjust the Intensity and Ambient Light as shown below. You can drag the lights around on the sphere to position them. Click on the other light and adjust its settings as well. The light that is currently active will have a small square around it. Make sure you have the Preview button checked so you can see your updates. To apply the logo, you created in a previous tutorial, to the 3D object, it must first be made into a Symbol. Drag the logo into the Symbols panel. You can give the new symbol a name if you wish, and you can ignore everything else in the dialog box. Click the 3D effect in the Appearance panel to edit it again, then click Map Art in the 3D Options dialog. Each if the object's surfaces is represented in the Map Art dialog. When you have a surface selected from the field at the top, its corresponding surface on the object will be highlighted in red. Light gray areas on the surface thumbnail in the center of the dialog are those that can be seen, and dark gray areas are those that are hidden from view. Once you've located the correct surface, choose the logo symbol from the Symbol drop-down menu. Make sure you have the Preview button checked, then adjust the position of the symbol by dragging it within the surface thumbnail. You might have to stretch it a bit horizontally, depending on your original cup shape. For added realism, keep the cup path selected and go back to the Effect > Texture > Grain. Choose Soft grain, with a low intensity and a medium contrast. This will add a subtle texture to the cup, making it look more like Styrofoam. Make sure the Grain effect is below the 3D effect in the Appearance panel, otherwise you'll get some unexpected results! Sit Back & Relax, You're Now Finished! Once you are satisfied with the 3D settings, you can create a new Graphic Style and quickly apply it to other paths to create different mock ups. Below are two examples, with their original paths. Creating a quick and easy mock-up with 3D is a great way to show your client how their logo can be used in a variety of scenarios. Placeit is an online mockup generator that has over 11,000 ready to use photorealistic images in SMART Templates. All you need to do is pick a template, upload your design and you are ready to go. 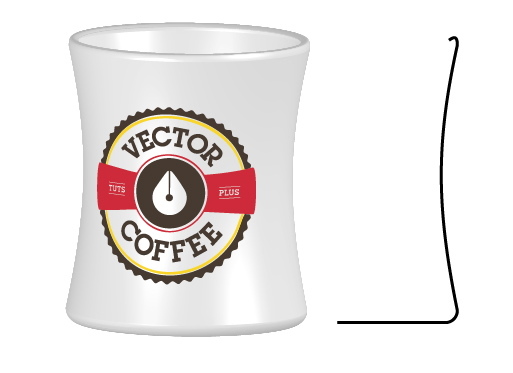 Here are a few examples of coffee cup and mug mockups.